A French cheesemonger and an American academic and ex-pat join forces to serve up a sumptuous history of France and its food, in the delicious tradition of Anthony Bourdain, Peter Mayle, and Pamela Druckerman. From the cassoulet that won a war to the crêpe that doomed Napoleon, from the rebellions sparked by bread and salt to the new cuisines forged by empire, the history of France is intimately entwined with its gastronomic pursuits. 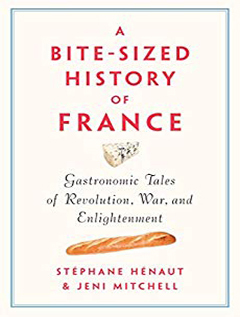 A witty exploration of the facts and legends surrounding some of the most popular French foods and wines by a French cheesemonger and an American academic, A Bite-Sized History of France tells the compelling and often surprising story of France from the Roman era to modern times. Traversing the cuisines of France's most famous cities as well as its underexplored regions, this innovative social history explores the impact of war and imperialism, the age-old tension between tradition and innovation, and the enduring use of food to prop up social and political identities. The origins of the most legendary French foods and wines—from Roquefort and cognac to croissants and Calvados, from absinthe and oysters to Camembert and champagne—also reveal the social and political trends that propelled France's rise upon the world stage. They help explain France's dark history of war and conquest, as well as its most enlightened cultural achievements and the political and scientific innovations that transformed human history. These gastronomic tales will edify even the most seasoned lovers of food, history, and all things French.